Canine distemper is a very contagious, fast acting disease that affects many different body systems in ferrets, including the respiratory, gastrointestinal and central nervous systems. It belongs to the Morbillivirus class of viruses, and is a relative of the measles virus which affects humans. Canine distemper is not only the most common viral infection in ferrets, but it is also the deadliest. 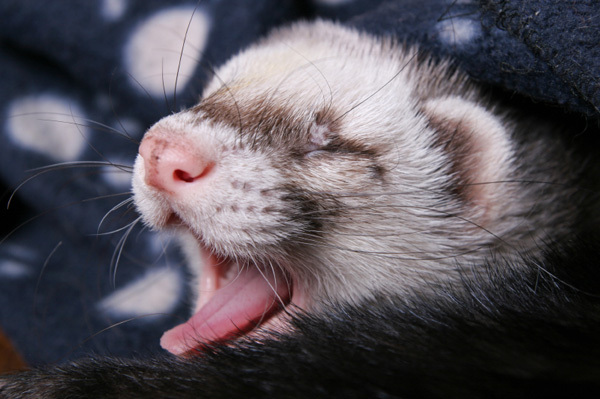 Canine distemper may also spread to the ferret’s nervous system, causing seizures and loss of coordination in the animal. the air to inanimate objects around the house. the ferret if it shows signs of pneumonia or any of the other symptoms listed above. virus. To preclude the animal from pain or future complications, the veterinarian will usually suggest you euthanize the ferret. Yearly vaccination appointments for the ferret is its best defense against this deadly viral infection.